Majuli is the world’s largest river island, which is situated in middle of the river the Brahmaputra, Assam. Majuli, the pearl island with its monastic institutions and ethnic-cultural mosaic, is a large island which lies north of the main channel of the Brahmaputra, presents a very different appearance. The land lies low, the population is comparative sparse, and extensive tracts are covered with high grass jungle and forests, which is rendered particularly beautiful by luxuriant growth of the creeping cane. The work of art of people reflects their identity. The Assamese community has taken shape with the intermingling of various ethnic groups and tribes. The island of Majuli is representative of the blending of various cultural groups.There are enormous prospects to develop the island as centre of tourism. The island with its rich diversity, island life style, endangered species is also known as “heart of the Assamese culture” as well as” SATTRA CULTURE”.The SATTRAs of Majuli are depositories of a large number of valuable religious and cultural documents and article of great historical values. Where the sun rises to the sound of a hundreds birds. And the evening resonates to the music of cymbals and kirtans. The historical significance of the name ‘Majuli’ goes in the form of a legend. Arimatta, the king, is said to have murdered his father. But, he was eventually struck by remorse. In order to wash away his sins, Arimatta made an offering, in the middle of the river Brahmaputra of gold, diamonds and other precious things. But the Brahmaputra did not accept the offering and instead broke away into two as if opening the two areas wide. This left a region of sand in the middle and this region came to be Majuli. The word Majuli comes from the word “Majhali”- meaning a stretch of land in the middle. Again, legend says that Lord Krishna had come to Majuli a route from Kundilnagar to Dwarka, after kidnapping Rukmini. While resting here, he was struck by its serene beauty and its resemblance to the city of Dwarka. He prophesied that Majuli would be known as the second Dwarka in future. 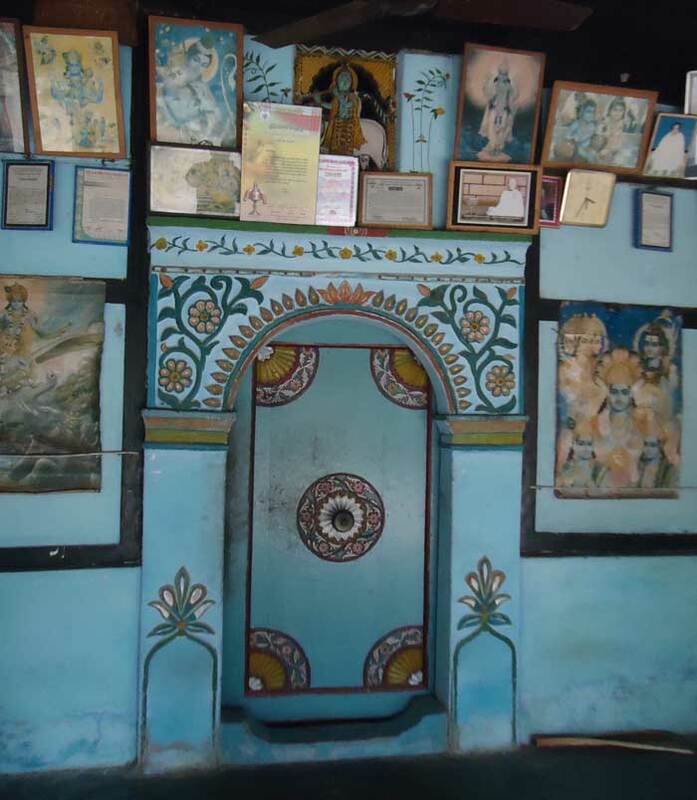 Following this popular belief, the saint Sankaradeva meet Madhabadeva in Dhowaghat, Belguri. The meeting is referred to as the ‘Mani- Kanchan’ union. Assam is a land of the Neo-Vaishnava religion. Great Vaishnava saint of Assam, Sri Sri Sankaradeva formulated the doctrines of his own brand of Vaishnavism called ‘Eksarana Namadharma’. The Eksarana Namdharma faith spread far and wide in Assam, as well as some parts of North-East India. The Sattras of Majuli spreads and conserve the faith of the religion. Eksarana Namdharma, as implied by the term, has three articles of faith- Eksarana (shelter beneath one God), Satsanga (assembly of Bhakats for Bhakti) and Nama (chanting as a means of prayer). Popularly called Mahapurushiya Dharma, it forbids the worship of idols and elaborate rituals while advocating an austere lifestyle for the Bhaktas. In the Vaishnava fraternity every individual was considered equal and neither caste nor religion was to be taken into account while inducting anyone into the faith. The prayer services could be conducted by any caste within the circle of Bhaktas and Mah-Prasad, or offerings, distributed amongst the congregation by everyone. NAMGHAR is the worshing place of the religion. There are a number of religious texts and books which are considered Holy Scriptures in Vaishnavism. For example- The Bhagawat, The Kirtan Ghosa, The Gunamala, The NamaGhosa etc. A unique feature of Assam Vaishnavism is the Sattra Institution. The Sattras of Assam are depositories of a large number of valuable religious and cultural documents and articles of great historical values. Sattra means- Sat + Tra= act of going to a sacred place, that means where deliverance of Sat(honest-pious people) is taking place is called a Sattra. Here the Vaishnav (worshipper of Vishnu) maintained a celibate status and stent their days in austere living and constant prayers. 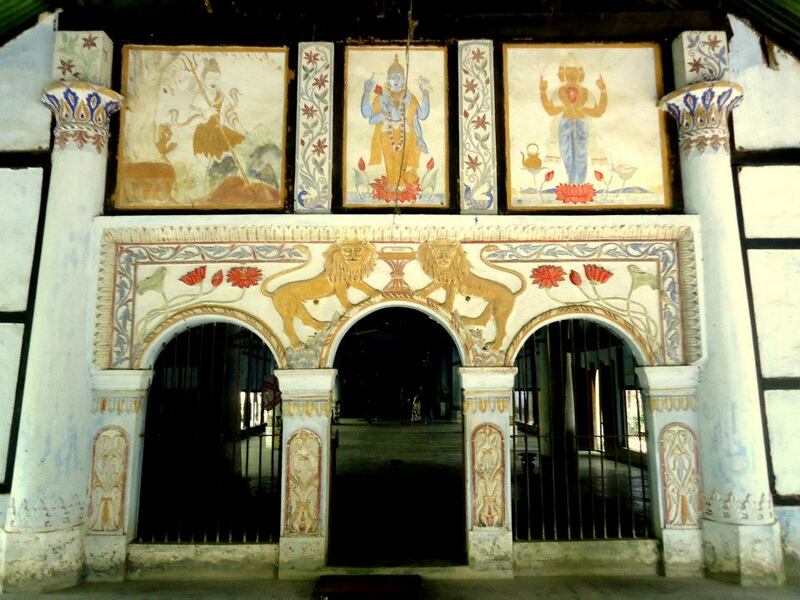 Sattras are monasteries which represent the organizational set-up originally developed to propagate the Neo-Vaishnava religious and social ideals but which also become the centre for the cultivation and invention of all kind of art and refinement. While the concept of the Sattra have been developed by Sri Sri Sankaradeva. It is the institution which is to motivate the mind of the people through the ritual performances to realize the existence of supreme power, various performances, ‘Ankiya Bhaona’, ‘Dances’, ‘NamPrasanga’, ‘Gayan Bayan’, Prayers, religious festivals like- ‘Ras Yatra’, ‘Palnaam’, ‘Sanskara’, etc. are regularly held. A typical Sattra Intitute is made up of several structures- Namghar and Manikut, Gurugriha, Bharal, Vaishnav griha Sarihati, Karapat, Atithishala, Natyashala and Bhogghar. 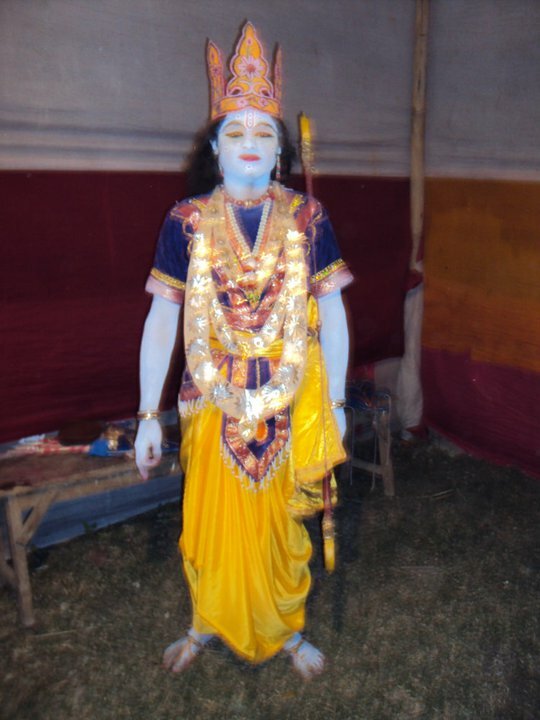 The Sattradhikar is the chief of a Sattra. He is responsible for management and conservation of the Sattra. Some major Sattra institute of Assam are Auniati Sattra, Dakshinpat Sattra, Garmur Sattra, Benganaati Sattra, Samaguri Sattra, Kamalabari Sattra etc. Sattras are depositaries of performing arts- dance, drama and music. Some major art and craft of Sattras are- Hengul Haithal painting, Mask Culture, Pottery Culture, Bamboo works, Wood Sculpture. 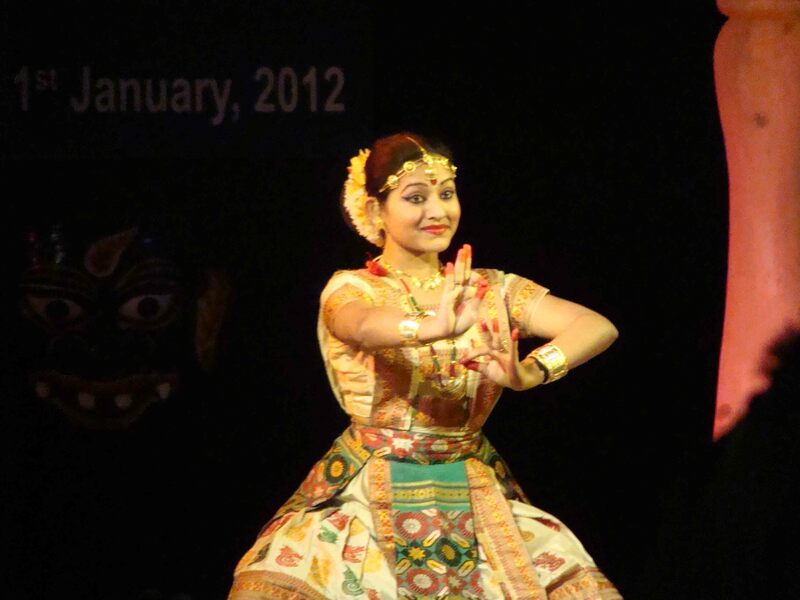 The classical dance of ASSAM is called SATTRIYA DANCE. Because it is take shape in Sattra Institute. The Sattriya dance was first introduced by great Vaishnava saint Sankaradeva in 15th-16th century. Madhabdev and other disciples of Sankaradeva also introduce some dance. The Sattras of ASSAM also introduce some dance individually. They introduced these dance to popularize the Neo-Vaishnava religion. It is a stream of Indian classical dance. Now Sangeet Natak Academy also recognize Sattriya dance as a classical dance. Dhemalir naach, Sutradhari naach, Gosain or Krishna naach, Behar naach, Bhangi naach, Rasar naach, Chali naach, Jhumura naach, Nadubhangi naach, Natua, Ojapali, Apsara etc. 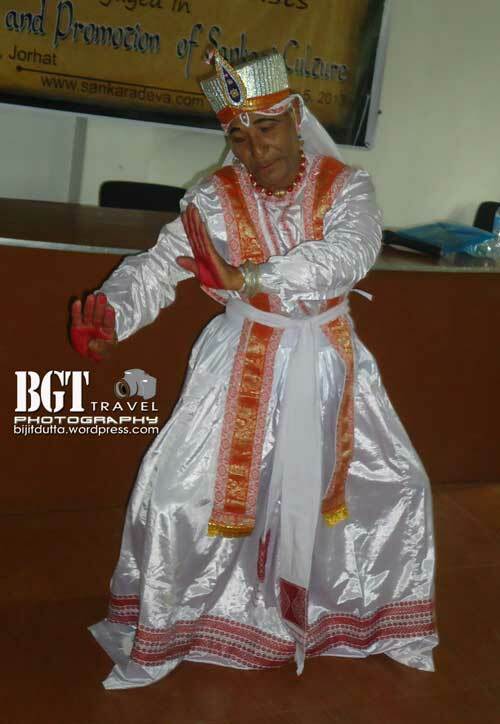 There are more than thirty five types of Sattriya dance in MAJULI itself. These dances are performed by both men and women or individually. Vaishnava saint Sankaradeva is the creator of a unique dramatic form, the Angkia Bhawna, which were written in Assamese, Maithili and Sanskrit. Since dance and music plays an important role in his dramas, he was also an innovator in that art form. Sankaradeva translated several cantos of the Ramayana and the Bhagawata, compiled a number of episodes and wrote plays and songs. To perpetuate the recital of Vaishnava classics and the performance of dramas, and the spread of Vaishnava teachings. He established monasteries in Assam, and his disciples carried the torch of Sankaradeva’s gospel to different parts of Assam by the processes initiated by their master. The Sattras are still in existence and age has not staled their sanctity and popularity. Poetry was not the only medium of propagating the Vaishnava cult. Brajabuli prose was introduced in the dramas. Angkiya Bhawna is an integral part of Vaishnava culture. Plays written by Sankaradeva and Madhabdeva are depicted in a drama form. The several Sattradhikars and Vaishnava scholars are also wrote and directed many dramas. The name of the drama written by Sankaradeva is Sihna Yatra, Kaliya Daman, Keli Gopal, Ram Vijay, Rukmini Haran, Parijat Haran, Patni Prasad. Actors clad in gorgeous dresses to enact the various mythological figures. Actors also ware mask in face and body, where character demands. The social environments mean its population, education, ethnic groups, religion, administration, business, cultural arrangements etc. The population density is low compared to area of Majuli. The human resources of Majuli establish a landmark in every field like- social, educational, regional, political, economical etc. The ethnic groups also play a major role to establish a healthy social environment. Majuli is the meeting ground of ethnic groups such as Koch, Chutiya, Mising, Deori, Kaibortya, Sonowal Kachari etc. The religion of Majuli “Eksarana Namadharma” constitutes the people. Another ingredients of social environment, business, play a major role in socio-economic development. Agriculture is main source of income. About 90% of the residence are associated with agriculture. The people of Majuli are well educated. Educated or highly educated people live in the island in high volume. The literacy rate in Majuli is 77.9%. Cultural arrangements are main ingredient of the social tourism. Majuli had welled develop cultural background. The Sattriya culture as well as the cultures of various ethnic groups plays a major role to establish a culturally rich island. The natural tourism means its geographic location, geo-nature, climate, land, river, plants, animals, birds etc. The geographic location, geo-nature and climate played a crucial role in the natural environment in the island. The land of Majuli is mainly silt and it is a mixture of three types of land- sand, sandy land and muddy land. These types of land are very useful to agriculture. Almost all sector of the environment of the island are influenced by the river. The Brahmaputra is back bone of economy of Majuli. There are many water-born resources and many local and migratory birds are found in those wetlands. As a result, a beautiful and colorful environment is produced to develop tourism infrastructure. Both natural and local plants are help the people of Majuli in every segments of there lifestyle. The animals also influenced the lifestyle of people of Majuli. The animals are played a major role in foods, making such goods as well as work done. This village is in upper Majuli. The people of Sonowal Kachari Village were engaged in washing sand for gold under the Ahom Kings in the Subansiri River and Dikhow River. They bring the gold to the royal granary of Bhuyan Kingdom, Chutiya Kingdom and also to Ahom Kingdom. They generally washed sand for gold from January to March. They were not washed sand for gold in last lunar day, eleventh lunar day, and full moon day and in last day of Assamese month. About 20,000 peoples were engaged in this profession in the time of Ahom King Chakradhwaj Singha. In 1884, British banned this profession. The pottery culture in Salmora and Chinatali Kumar Gaon are continuing from very old age. 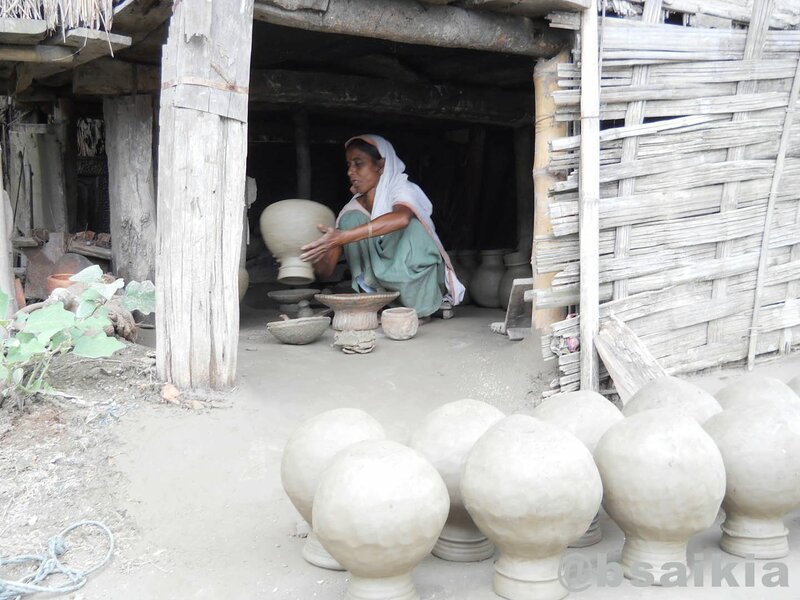 There are five types of potters at the times of Ahom age in Assam. They are- in Royal custody, Private estate, Sattriya, Bankrupt and Public sector.The types of potters of these villages mainly built- pot, receptacle, Tekeli (small water jar with nech), mola ( a small earthen vessel/ cup for cooking),Nadiya ( a large earthen pot), toy, etc. Peoples of Salmora also build boat. Thay are professinal boat builders. 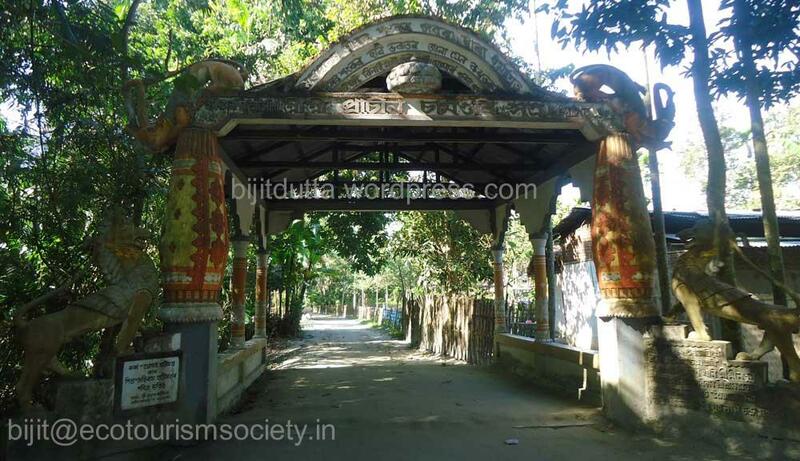 There are two Sensowa (falconer) villages in Rabanpara of Majuli. The peoples of these villages are falconer of the Ahom King. They gave training to the falconer to catch the Crane. Ahom kings enjoys- catching of crane by Falcon as entertainment. A birds retreat is available in Rangali Bahar now. This birds retreat was built by Ahom king Pratap Singha. On the regime of Ahom King Siva Singha, queen Phuleswari established few goldsmiths in Sonariati to worship Vaishnav Mahanta. They make ornaments on the regime of Ahom Kings. Unorganized professionals are organized by Ahom general Momai Tamuly Barbaruah by giving practical education to self-support them. One of the main professionals of these types is Tanti (the weaver). There were two villages Bhakatiduwar and Pahumara in Majuli. The weavers are able to generate income through silk-worm rearing, weaving etc., women were able to attain economic independence, emancipating themselves further. Futher of Nation Mahatma Gandhi was enthralled with this. “Every woman in Assam is a born weaver. And she weaves fairy tales in cloth. I fell in love with the women of Assam as soon as I learnt that they were accomplished weavers”. The weaving culture of Assamese women deserves immense popularity even in the international level. The artistic uniqueness of ‘Gamocha’, ‘Chaddar’, ‘Ribi-Gaseng’, Mibi Galok’, ‘Miri Zim’ made by Assamese weaver brightness the possibility. Karal (a cementing substance) was made from egg of water-fowl, one type of rice, the cat fish (wallaga attu), molasses, a kind of resin etc. Karal was used to make temple, palace and bridge in Ahom regime. The Karal village is in Bongaon. Katani or Jogis, who at present from a considerable part of the islands total population, had there habitation in the island since at least the days of the growth of the Malinithan on the north, the Sakta-Buddist center on the Assam Arunachal Border and at best, since the days of the Chutiyas. Peoples of Jogi Gaon was rear silk worm, muga silk worm and Eri silk worm. They made yarn from them. They washed these yarn and cloths by a salted alkali made from leaves of the fig tree. Now they live in Garmur and Rangasahi. This profession of Assamese people is about 2500 years old. Historical records and social survey testify to the settlement of the Kai-bartas in Majuli to whom the profession of fishing, a profession traditionally associated with them because of their being river bank dwellers (Kai-barta, meaning one who lives on, or gathers his living from water), was much easier. There are about twenty Kai-barta villages in Majuli. Some people of Kai-barta villages are now associated with another profession. 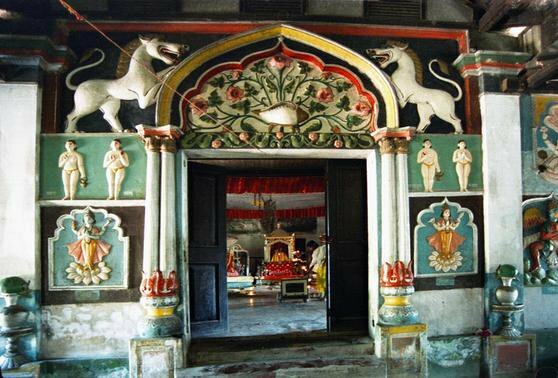 This village was in Natbar Chapori of Ratanpur on the regime of Ahom King Shiva Singha. After that, they shifted to lower Ratanpur because of erosion of river Dihing. Men are associated with song and music in the temples on the regime of Ahom Kings. Unmarried women was dances Debdasi ( a temple dancer). One of the cleaver Debdasi Phulmati becoming Phuleswari after married Ahom King Shiva Singha.This royal profession was destroy because of extinct of Debdasi tradition. Karhi (an archer) are a class of people during Ahom reign. They fought for Ahom Kings by bow-arrow. They also makes arrow for using in war. There are other professional villages which are on destruction. They are- Kumar Gaon where blacksmiths were live, makers of fine mats were live in Patia Gaon, peoples of Raidangia Gaon supplies rattan cane, peoples of Perabhari Gaon carried trunks of Ahom Kings, peoples of Da-dhara gaon are body-guards of Ahom Kings, etc. Majuli is the meeting ground of various ethnic groups. These ethnic groups speaking different dialects, representing different social and political institutions, manners and customs give rise to the ethological peculiarities of Majuli. Ethnic groups such as Chutias, Mising, Deori, Sonowal Kachari, Koch, Nath, Koibortya, etc. are lived in Majuli. The Chutias:- The Chutias are the most powerful indigenous of Assam. They are of Mongoloid origin and their original language was closely akin to Bodo, and their language may fairly claim to be the original language of Assam. The early history of the Chutias is not definite. Although of all tribal people of Assam, they alone had a written language but they made no use of it in recording events. The Deoris:- The Deoris are one of the four divisions of the Chutias, who reigned eastern Assam prior to the advent of the Ahoms. The Deoris were the priests of the Chutias. They preserve the language, religion and customs with a little change. The Ahom King shifted them to Majuli and thence gradually scattered to the different parts of Assam. 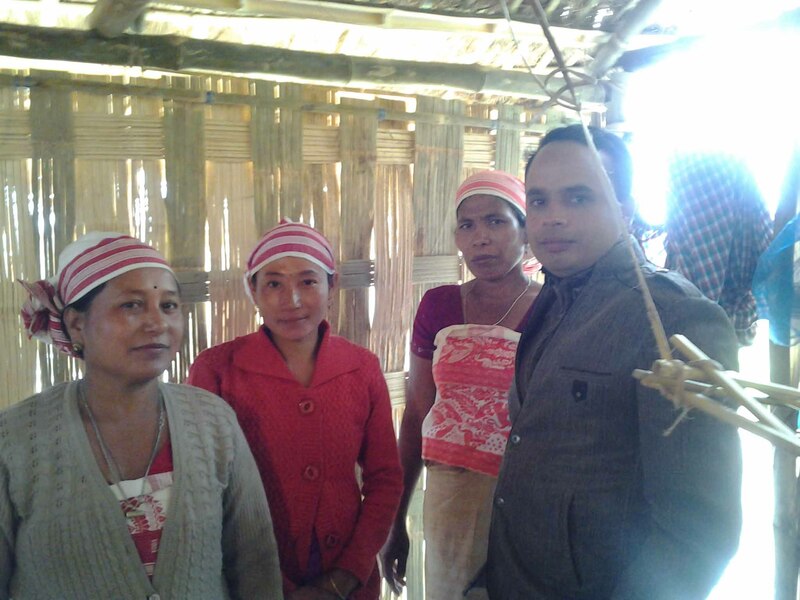 Though possessing some cultural traits of their own, the Deoris are perfect Assamese and they know Assamese very well. The Deori village consists of thirty or more households. The houses are constructed on a bamboo platform raised about five feet above the ground. A Deori woman normally wears a petticoat tightened with another horizontal piece around her loin besides a piece covering her head. They use Gapa (a cane lodge) and a Pera (a wooden box) to keep their personal valuables. The Deoris prefer rice beer to water even while quenching thirst. They celebrate all holy occasions on Wednesday only. They observe the Bihus- the Baisakh Bihu during the month of Baisakh and Magh Bihu during the month of Magh. 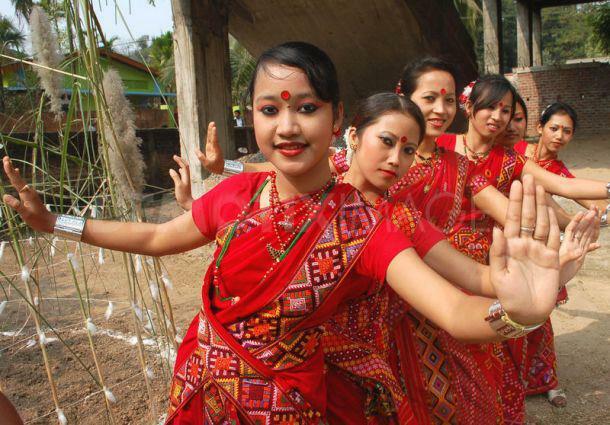 The Bihu festivals of Assam is called Bisu by the Deoris. One of the main features of the Bisu festival of Deoris is the Deodhani Dance rather then the Huchari (a form of community dancing of Assamese people). They are the only tribe who celebrate Bihu at night also. Marriage are generally planned and arranged by the parents. Divorce in rare. Widow re-marriage are allowed, but big celebrations is not allowed. The dead bodies are as a rule cremated. In case of epidemic they are buried also. Shradha ceremonies with funeral feasts are observed by the Deoris. Agriculture is the main source of income. In many Deori village there are traditional community weaving centre of the girls, which failed to thrive due to lack of proper marketing and facilities. The Mising:- The Misings are said to be the block buster from northern hills. They were the only hill people who close to come back to the plains and settle, not to go back again. At first they settled at the foot hills from Diheng on the east to Sisi on the west and then spread over the northern bank of the Brahmaputra up to the Jia Bharali on the west and the Majuli Island. The Misings had already becomes plains people. The Mising were divided into two main sections: the Parbatiya or Hill also called Ghasi Mising and Plain Mising. According to an European traveler the Misings are not only remarkable for their beauty, they are however of good physique, well built and strong and are of yellow Mongolian type. They have deep-toned voice and slow method of speaking. A Mising house is built north-south wise and the house has only one door in front and one at the back and inside it is an open dormitory without any partition. Now the Misings employed themselves chiefly in growing paddy and mustard. Their woman folk are as carefree as the males. The Mising weavers still use their traditional loin-loom along with the common havel-loom. They weave a vertical flower design which is peculiar to them alone. The Mising women love black, white and blue colors. The Mising villagers go out for community fishing. Ali-Ai-Ligang is their most colorful festival. The most popular form of songs among them are called Oi-Nitam which are full of romantic flavor. The Kaibartyas:- The Kaibartyas are of Dravidian origin, the bulk of the population of the Brahmaputra Valley is comprised of tribes whose peculiar dialects belongs to the Tibeto Burma branch. The Kaibartyas are skilled in fishing, which were once prominent in the population live on fishing and agriculture. Women are expert in cultivation and handloom work. They believe in Hindu philosophy. The social manners and customs are same as other community. The Sonowal-Kacharis:- The Sonowal_Kacharis are belongs to Tibeto-Burma branch of Mongoloid origin. The Kacharis was very powerful at the time of the Ahoms arrivals. They washed sand for gold in Sobonsiri river till the British Rule. The traditional dance of the Sonowal Kacharis called Haidang Dance. Bathou Puja is the prime festival of them. The Kochs:- The Kochs are belongs to Bodo branch of Mongoloid origin. The Koch are very ancient community. The Koch is lived in Majuli before its island formation. They brings diversity in human composition in the island and its position in one of the many in social, cultural, economic and in political field. There are more other small ethnic groups in Majuli. The ethnic groups bring diversity in human composition in Majuli. Their culture, custom, colorful dresses, folk music and dance, folks and diverse tribal culture, is of special importance in Majuli. The rituals, music, dresses and dances find their fullest expressions in the festivals and fairs in different parts Majuli. Mask is the primitive literary works of mankind. It is also primitive literary works of art. 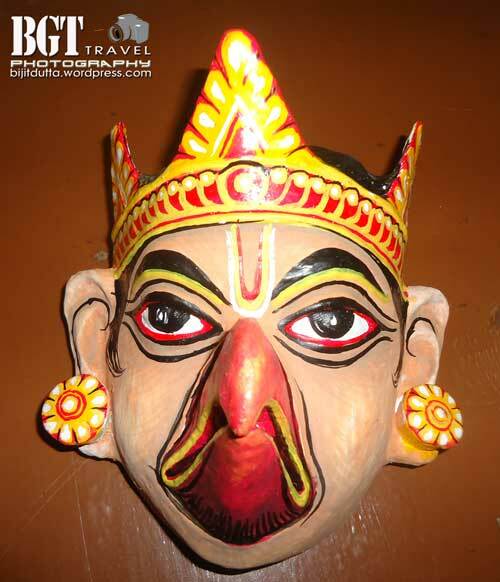 In Assam the mask culture was began from primitive age. 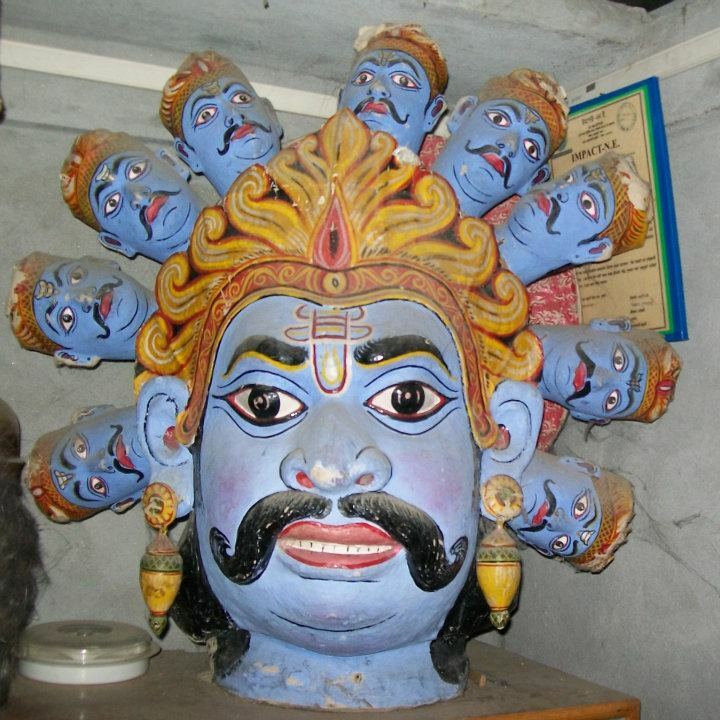 Generally masks are used in Bhaona (theatrical performance in old Assamese style). Mask is made using bamboo, rattan cane, cow-dung, soil and cloth. An ancient formula is used to making mask, which is known as Lakhimi Formula. Thin strip of bamboo is used in this formula of making of mask. After giving shape of the Mask, rattan cane is used to fasten the bamboo strips. Then the shape of mask is covered by a cloth which is plastering by mud of potter’s clay. After that the mask is keep to expose in sun-shine. Second stage, the mixing of cow-dung and sticky soil are used to plastering the mask to give shape. Again the mask is covered by a cloth which is plastering by mud of potters clay continuing to expose in sun-shine. Third stage, painting by Hengul Haithal. There are three types of masks. 2. Lotokai Mask– it is made part by part. Head and body part is separate. Hand, leg, etc of this mask can move. 3. Chow mask– it cover whole body. The height of this mask is about 8 to 10 feet. Mask culture is traditional culture of Samaguri Sattra of Majuli. The mask and the boats are paint with a special coloring matter called Hengul Haithal. The painting process by using Hengul Haithal is called Hengul Haithal painting. The meaning of Hengul Haithal is, Hengul means vermilion and Haithal means the yellow orpiment. Hengul Haithal is a mixture of minerals, vermilion and yellow orpiment, indigo and pale soil etc. At the early stage the ashes of skull of bottle gourd are used for black coloring. After this, charcoal is used in this process. A type of gum mixed in Hengul Haithal, which is found in seed of the wood-apple. It is a long process, where red color found from vermilion, yellow from orpiment, blue from indigo and white from pale soil. One week to a month is required in the process, where all the ingredients of Hengul Haithal paints are grind in a stone slab. The amount and shining of the colors are depends on the grinding of the ingredients. These paints are keep in a vessel of bamboo tube. The painters use appliance like brush from feathers of pigeon, hair of goat etc. The Sattra Institute of Majuli is famous for this painting. It is used in mask and wall painting. Majuli is heaven for birds. Its swamps-pools, river and forest are safe habitat for birds. Residential migratory, locally migratory, winter migratory, common and uncommon all types of birds are found in the island. A natural widespread bird’s colony is there. The Crow, Little Egret, Little Cormorant are heavily found in Gayan Gaon, Laobhaga Pathar, Alisiga, Bhakati, Saraisong, Pohardiya. In Namkatani Gaon, there is a vast colony of open-bill Stork. Majuli is not only a beautiful and traditional island but also even today it is recognised as pollution free. There are no industry and factory in Majuli. This brings a pollution free environment in the island. The amount of vehicles is also less compared to its area. 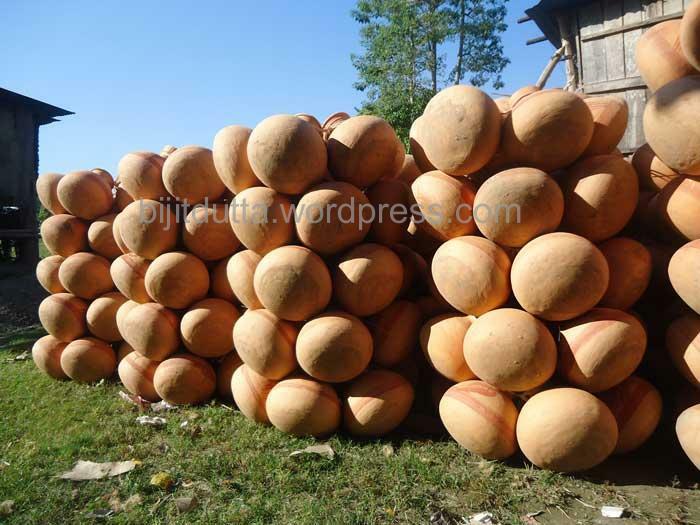 It is remarkable that the use of chemical fertilizer, pesticides are very limited in Majuli. It helps to resist pollution in the island. Visiting the erosion-hit areas at Salmora, Majuli, P K Bansal, Union Cabinet Minister of Water Resources and V H Pala, Minister of State for Water Resources, stated at a meeting held in the Majuli College playground near Daria Bridge that Majuli has enough potential to get recognition as a World Heritage Site from UNESCO. Bansal also said that the required nomination dossier for the recognition has already been submitted to the authority concerned. Bansal further said that Prime Minister Dr Manmohan Singh was very much enchanted by the charms of the river island and he especially directed them to get first-hand knowledge of it by coming to Majuli. Both the Union ministers said the Central Government is responsible for preserving the art and culture of Majuli along with its landscape. They also took part in the Bhogali Mahotsav organized by the administration of Majuli subdivision. The Centre has formally submitted a new dossier on Majuli to the Paris-headquartered Unesco to make a fresh cla-im for inclusion of Asia’s largest river island in the World Heritage Site List. The 36th session of the World Heritage Committee convention (under Unesco) will be held at Saint Petersburg, Russia, from June 24 to July 6, during which Majuli’s claim for World Heritage Site tag will come up. India is among the 21 countries which are members of the World Heritage committee that evaluates the proposals for World Heritage Site tags that flow in from across the world. On January 24, the Archaeological Survey of India formally sent the 1,256-page dossier comprising six volumes, called River Island of Majuli, Cultural Landscape and Living Traditions in Midstream of Brahmaputra in Assam, to India’s permanent representative at Unesco headquarters in Paris, Vinay Sheel Oberoi. The proposal, which has been sent for evaluation in the cultural landscape category, was approved by the Advisory Committee on World Heritage Matters of the Archaeological Survey of India. The new dossier had been prepared by M/S Kshetra — a Hyderabad-based firm owned by conservation architect G. Suryanarayana Murthy — after several visits by Murthy and his team to the island last year.